Jakarta's Jonathan Kusuma (aka Ojon) has been an underground dance music figurehead in Indonesia and beyond for several years now, quietly establishing himself as one of the region's very best house and techno guys. For the uninitiated though, the prolific musician, producer and DJ is currently signed to I'm a Cliche, a notable French boutique label that was responsible for putting his outstanding debut EP Gong 3000 back in 2014. In addition, Ojon also has several releases around the world with buzz-worthy imprints such as Optimo Music (Scotland), Factor City Label (Barcelona), Machine Limited (US), Clouded Vision Label (UK) and Love on the Rocks (Berlin) as well. In the coming months, he has a number of highly-anticipated cuts scheduled on Cocktail d'Amore (Berlin), Ene (Japan) and Correspondant (Paris) as well. As you can see, many around around the world are drawn to Kusuma's distinctive sound. Equally influenced by 80s-era synth disco and traditional Indonesian music, Ojon's sought-after productions consistently blend urban futurism with a nod to traditionalism. And while his solo output is making waves globally, Ojon is still very much rooted to his homeland. As one of the founders of Space.rec, a seminal underground Jakarta record label that put out albums and singles by Indonesian musicians, alongside his pivotal role within Indonesia's Rossi Musik scene as one of Akamady Records' bosses - Ojon has done much over the past few years to put Indonesia on the global dance music map. Outside of his business and solo ventures though, Kusuma is also recognized as a member of Space System, a well-known experimental electronic jazz band that's made a name internationally with highly regarded releases in Glasgow, Bandung, Malaysia, Italy and the UK. 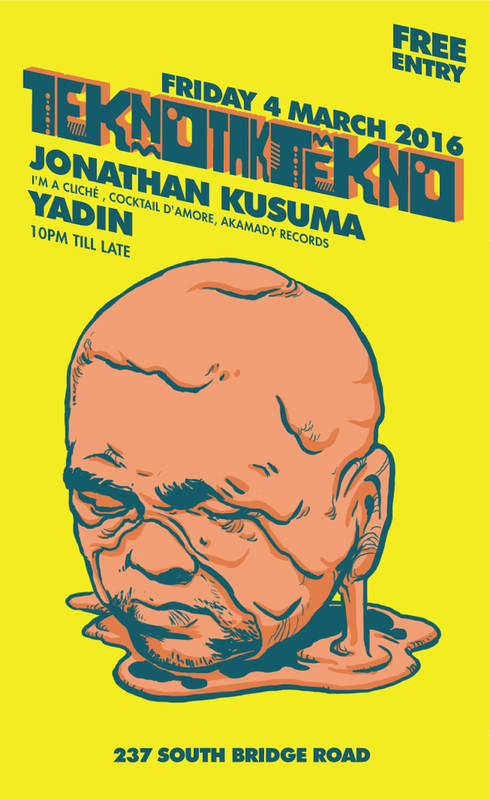 This Friday, Jonathan Kusuma, drops by CATO for a special late night set, and he'll be sharing the decks with none other than local techno connoisseur Yadin - so you can expect some proper vibes on this one. And since this might also be Yadin's last set in Singapore for a while (the DJ is moving to Bali next week), you'd definitely be remiss if you skipped out on this edition of TEKNOTAKTEKNO. TEKNOTAKTEKNO happens of Friday, 4 March at CATO. Click here for more details. Please join TEKNOTAKTEKNO for more updates.